MK IV TDi/Lupo TDi/Yeti 4x4 TDi. Took some pictures with my fresh washed Lupo my girlfriend's red New Beetle transformed in Rudolf. Also added some pictures with the TDi at a lake nearby back in August. TDi already had better parts.... and even the 13" Alloys I've had did not fit on TDi because of the bigger front brakes...but that is no problem because I've got now some badass mint ATS CUPs:)) To be fair, I've took the oem mudflaps from the 1.0 and installed them on the TDi because in Romania they are verry hard to find. I've search all the scrap yards and online advertisments almost for 1 year untill I've found this set, which still doesn't have the VW logos....took them of a Cambridge Edition from UK that yas crashed and imported to Romania. The sad part was that the car was damaged on the back side and the SPECIAL Tinted taillights were smashed... I am still looking for some for having the full Cambridge package on my TDi along with the steering and gear knob which I already have. No problem @Blue Loop. I think they make the car look wider and more stable. 😁 Found some pictures with both of them and the Green Mk4, about I've told you, back when we bought the 1.4 TDi and uploaded some pics with the 1.0, that we sold, aswell. The 1.0 was with black door plastic strips and yellow, black mirrors and grey interior when the 1.4TDi has them painted and the interior is more like yellow and dark grey/black,and it has a glovebox aswell. lupo_ro replied to john17's topic in New member? Hello! In the rows below I will tell you how I felt in love with smallest Volkswagen car- The Lupo. Back in 2014, when I was 16, my dad bought a Lupo, a cheap little car, with a 2001 YELLOW 1.0 MPi engine for driving around town. It😂 was a easy to work on and quite reliable car. When I've got my driving licence, two years later, at 18, I've started my driving experience behind the wheel of this small city car...and what an experience . For me, a "car guy" it was really easy to drive also, but for some of my friends that learned to drive only diesels that start to move only by depressing the cluch, this small engine needed also a bit of throtle, and they used to stole it for the first times . For driving around town it remains the best choice, but, since we are living in a area full of hills, driving it outside city coud show you that the car can be a bit sluggish. After half a year or so, the 1.0 was listed on the selling market and I was looking it's replacement. In the evening before Easter, I found another YELLOW Lupo, this time a 2002 1.4 TDi, in better shape and being better equipped (powered windows and mirrors, butterfly rear windows, nicer colour scheme interior, cambridge leather steering wheel and shifter knob, A/C, heated windscreen wipers and projectors :D). The next day we bought it and came back home in two YELLOW "bugs". Everyone who saw us on the road was looking really funny to me and my dad :)) We had them for around 6 mounths, and took them out together almost everyday. After the 1.0 was sold the 1.4TDi remained with our 2002 Mk4 ALH-TDI that we own since 2007. My dad added to his garage this summer a 2011 Skoda Yeti 4x4 TDi Experience for long journeys. Driving all of these cars, I can say everyone is different in it's own way and think the 1.4TDI suits me the best. It feels quite nippy, compared to our Golf ALH 90HP and even the monster Yeti (Think the last owner remapped it, not verry sure but fells faster compared to other 1.4tdis I drove) and verry easy to park. 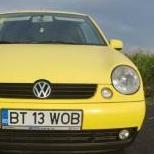 TDI is registered as BT(my county) 13-my birth day WOB-obviously City of Volkswagen-Wolfsburg The 1.0 was random BT 05 ROU-could be From Romania. Apart from service intervals I haven't touch the car with any modificaton. (oh, forgot that I tinted the windows :)) ). Until today, when Santa came a bit lately, with a fresh set of ATS CUPs 15x7J ET28 wrapped with 195/45 R15 Hankook summer tires. I've added pictures below with the car and wheels. I will search old photos with the much loved 1.0 that was sold back in February this year. lupo_ro replied to Y2ACP's topic in New member? It looks verry good! For the clock....you have two small buttons near the clock indicator (they are blending with the other screws in the cluster design). Push the left one to change the hour and right one for the minutes. You also have another button under the mileage counter display for reseting the trip mile. Wish you a Merry Christmas and no problems at all with your "poket rocket" :D! Have a good one! Hi, Clayton! I really love your build! I think your GTI is my favourite one atm. I like how you transformed the car since 2013. 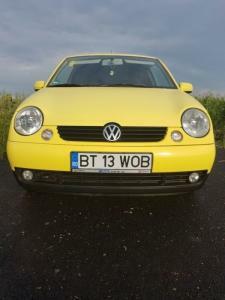 I have started with a 1.0 yellow Lupo, now having a yellow TDI with remap ( around 100hp). I follow you on insta and YT. I want to see more activity on YT with your angry little Lupo Cheers from ROmania! Have a good one! Lupo original stereo sockets! HEELP! Hi! I am back. I want to ask you something. Could you send me some pictures with the factory originals stereo sockets? (mine is Alpha) (Brown one and black one).I want to see how the cables are fitted. Thanks! Golf Mk3 front speakers on Lupo..Will they fit? Hi! Just wondering if a pair of Golf Mk3 front speakers will fit on my Loop. Thanks in advance! How good is Topran for oil pump manufacturer? !